The TechCrunch founder is leaving the ethics-challenged world of Web journalism for the morally flexible world of high-tech finance. Now who are we going to make fun of? First we learned there was no Santa Claus. Now we hear Michael Arrington is leaving TechCrunch. We cannot adequately express our feelings of loss and, well, loss. We are devastated. It seems Mr. Arrington is getting out of the ethically nebulous journalism racket and going into ethics-free investment biz full time, via Aol.’s new CrunchFund. Finally, something Arrington and we can agree on: He’s no journalist. And now it looks like eSarcasm may no longer have Michael Arrington to kick around any more. Here are a few of the things we’ll miss. 1. His open mind. Few in or out of journalism have the courage to take patently absurd rumors and broadcast them to the masses. Google buying Digg? Apple acquiring Twitter? No story is too ridiculous or too thinly sourced – as long as it generates traffic. 2. His ability to introduce market-defining, life-changing products, like that dead simple Web tablet. Oh, sorry, that’s Steve Jobs. We always get those two guys confused. Our bad. 3. His unimpeachable ethics. Arrington has set a standard few mortals could match. As he himself put it, "Friendships and marriage are far more potent than financial conflicts.” Fortunately for the world, he has neither friends nor family to stand in his way. 4. His eerie resemblance to Leonardo the Ninja Turtle. 5. His tireless efforts to educate mankind. How many times did Arrington patiently explain to the rest of the world how journalism is supposed to work, despite the fact that — unlike stories on TechCrunch — it would not personally enrich him in any way? Too many times to count. 6. The literal spitting matches his writing inspired. Come on, you really think something like that would ever happen to MG Siegler? 7. His sartorial splendor. Arrington’s fashion sense gave new meaning to the word "schlumpy." 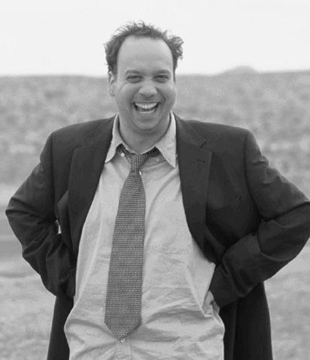 He is truly the Paul Giamatti of the high-tech world. 8. His uncanny investment sense. If TechCrunch picked an otherwise obscure startup and wrote about it dozens of times in a year, you could be fairly sure it was an excellent opportunity — especially for Arrington and his VC friends who stood to make a mint when it went public. 9. His willingness to attach the word "crunch" to anything. For example: Look for Arrington’s new line of feminine hygiene sprays, CrotchCrunch. 10. The JooJoo tablet. Nuff said. 11. His TMZ-style interview technique. Remember when he so pissed off Carol Bartz on stage at TC Disrupt that she told him to perform an anatomically impossible act? Where else can we possibly see that kind of arrogant, disrespectful approach? Oh, right…TMZ. 12. His indelible influence on America’s youth. Think of the countless interns he trained in his impeccable ethical standards. Anyone can find an intern willing to go down on the boss, but it takes a true visionary to find one willing to whore himself out to the entire tech industry. 13. His complete and utter lack of irony awareness. Remember that time he got "ripshit mad" when other bloggers published unofficial info on one of his projects? Ah, the memories. 14. We’d tell you, but it’s under embargo. There’s only one thing left for us to do: Contact the Nobel committee, and tell them we’ve got a lock on their 2011 Peace Prize winner. Mikey, we hardly knew ye. Let’s keep it that way. Image of Arrington saying “I’m Number One” by Joi Ito via Flickr.